I think you should understand that they give you options for different passes, and there is one pass with no black out dates and let me tell you I have definetly gotten my monies worth!!! If you use your pass 3 x’s a year thats about $300.00 worth and that’s more than two of the passes cost! Get your story right, disneyland has great deals, you just need to know how to use them!!! Plus the premium pass pays for your parking too… I have gone 12 x’s this year and well you do the math, it paid both parking and my entrance to both parks…. What do you think that would of cost me without the pass? They do u a favor by blocking you, those dates are fair warning that you dont want to be in the park on those days! If you need to bucause of visitors or such, then you go in at a discount or upgrade to the next pass and only pay the difference. Please UPDATE the Calif. Annual Pass Calender…you have it listed 2009, this is 2011!!!!!!! You know i get what the guest is saying about all the blackout dates.KnottsBerryFarm has one block out date for its annual pass and Universal has maybe two block out dates. The blackout dates for the cheapest one are RIDICULOUS! 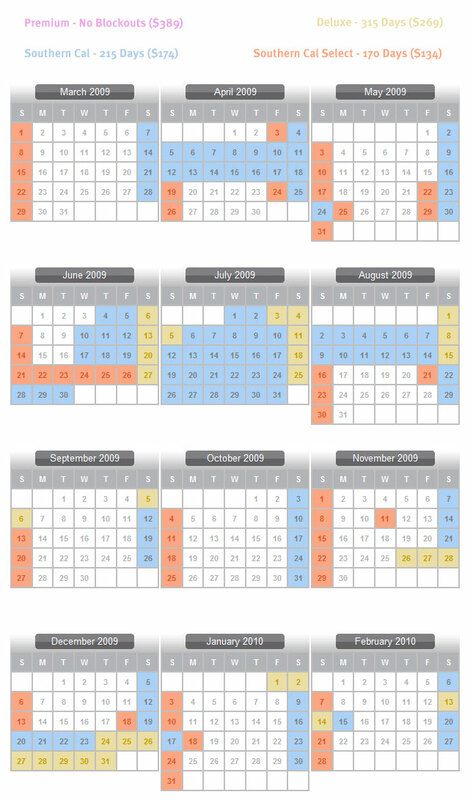 For the 2011 calendar, there are NO days in July, right when my kids are on Summer Vacation? We purchased these today, in fact, and the person working didn’t give us any heads up whatsoever! Not very impressed to say the least.. Please send me calander for Deluxe passes that we paid $269.00 each.